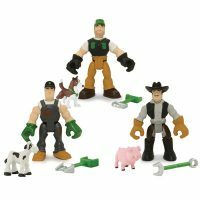 Johnny Tractor Activity Table – Bartron Supply, Inc.
Adorable, functional, multi-purpose piece of furniture that would delight the heart of any child!!! 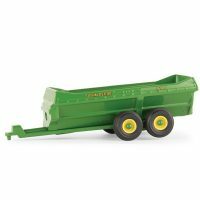 Constructed with sturdy mdf, and easy to assemble, this item features the image of Johnny the tractor on both outer sides of the play table in the cheerful, bright John Deere colors. The table has three colorful storage bins on one side for use in storing toys, books, games, etc. Above the bins there is a yellow shelf with holders for the chalk and eraser that can be used on the flip-up chalkboard that is framed in bright green. The other side of the play table features a flip-up white board, and also has a yellow shelf with storage designed to hold the markers. On this side of the Play Table, there is room to slide the chair in underneath the top edge when folded down. 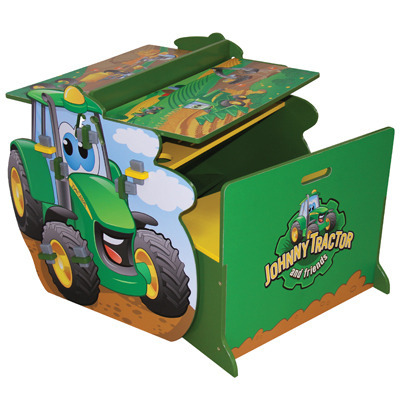 The chair features storage under the bright yellow flip-up seat, while the chair frame is finished in bright green with the Johnny Tractor image and logo on the outer back side. 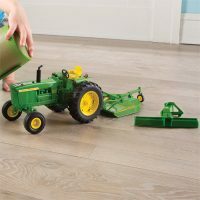 When both of the top surfaces of the Play Table are in the closed position, the top surface of both sides has a colorful “work” surface that your child can use to play with his little trucks and tractors on for many hours of playing fun. 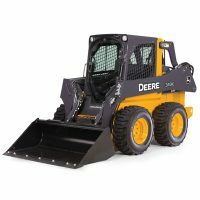 This is an item that is sure to delight any child with its many features of play time, as well as the practicality of having a little extra storage space! Easy to assemble. Hardware & assembly instructions included.